This is an English medieval locational surname. It is also one of the most noble of all English surnames, being the family name of the earls of Chesterfield, and yet it is a name with one of the simplest origins. It derives either from the pre 7th century Olde English words "stan" and "hopa", and describing a dweller on a stony ridge, or from the village of Stanhope in Durham, of the same meaning, first recorded in 1228. The surname development includes: Sir Richard Stanhope, Lord of Eltswick, in the county of Northumberland in the Hundred Rolls of 1327, and Sir Edward Stanhope of Rampton, near Nottingham, and John Stanhope of Cannon Hall, near Barnsley, in 1600. The recordings also include Sir Philip Stanhope, the earl of Chesterfield in 1628, and in the year 1780 Philip, earl of Stanhope, of Stanwell House, Middlesex. Not surprisingly perhaps there are no less than sixteen Stanhope coats of arms. 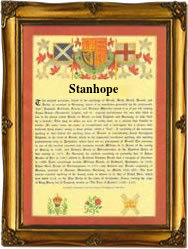 The first recorded spelling of the family name is shown to be that of Sir John Stanhope. This was dated 1272 in the heraldic roll of chivalry known as "Jenyns Roll". This was during the reign of King Edward Ist of England, 1272 - 1307. Surnames became necessary when governments introduced personal taxation. In England this was sometimes known as Poll Tax. Throughout the centuries, surnames in every country have continued to "develop", often leading to astonishing variants of the original spelling.